Made from oranges grown without reliance on artificial chemicals and fertilisers. 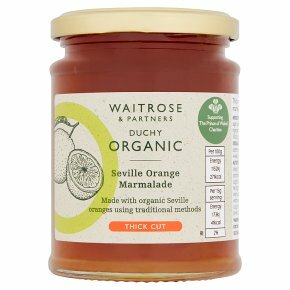 Good Food - Chunky organic marmalade, made with thickly cut Seville oranges, hand stirred in open pans for a chunky texture and robust flavour. Good Farming - Organic farming works with nature using methods such as crop rotation and clover planting to build fertility in the soil. Good Causes - Sales of Waitrose Duchy Organic products provide a donation to The Prince of Wales's Charitable Foundation. This year, over £2.5m will be donated to the Foundation, supporting good causes across the UK. Since 2009, you've helped to raise over £17m for initiatives such as the Duchy Future Farming Programme, which helps farmers develop more sustainable farming practices. * Approved non organic ingredients. Prepared with 38g of fruit per 100g. Total sugar content 65g per 100g.